Central Buenos Aires is undoubtedly one of the world's great tourist destinations. Days could be spent walking among its narrow streets admiring the plentiful art noveau, art-deco, beaux-arts and other architectural styles. 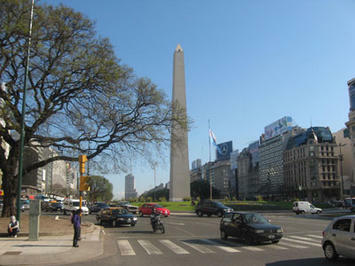 The triumphal Avenida 9 de Julio is one of the world's widest boulevards with two interior roadways of up to seven lanes and two service roads of two lanes, with a Washington Monument type obelisk at Avenida Corrientes (Top photo). Avenida 9 de Julio is bordered by buildings that are both ordinary and impressive, such as the Colon Opera House. There is also an attractive area of redevelopment adjacent to the core in the former dock area, Puerto Madero. The old port buildings have been converted to commercial uses, especially restaurants. A number of high-rise condominium buildings have been constructed beyond the old port basins. Government buildings more than match the commercial architecture, with the National Congress and the Casa Rosada, or "Pink House," with its balconies from which President Peron and his wife Eva used to address the public (Photo 2). Not more than two weeks ago, former President Nestor Kirchner lay in state to be visited by in an emotional outpouring by hundreds of thousands of Argentineans. 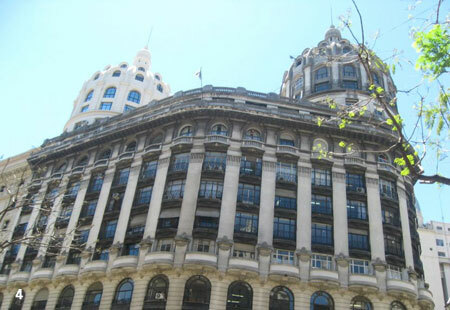 The city of Buenos Aires also has a distinctive legislative building (Photo 3). 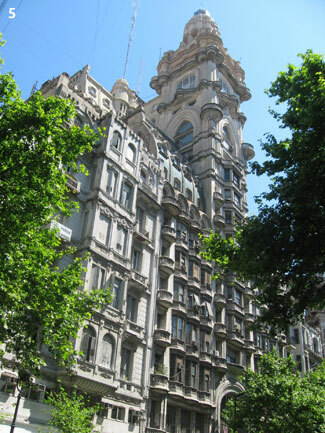 These older romantic styles make Buenos Aires a wonderful walking environment. Most were erected in the first three decades of the 20th century. This was Buenos Aires at its zenith. Then, Buenos Aires was capital of one of the world's acknowledged economic powers. 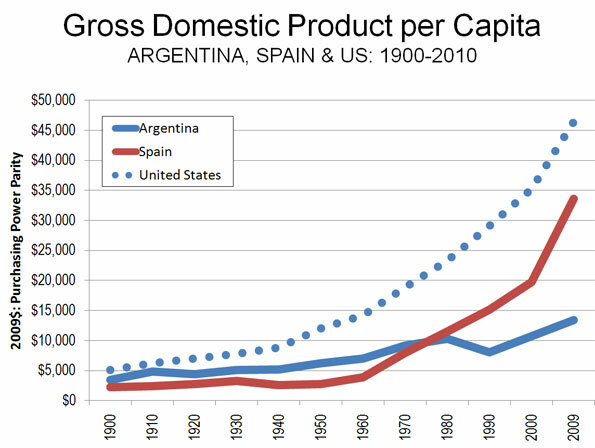 Argentina generally ranked around10th in gross domestic product (GDP) per capita during that period (Note 1). Thus, today, the tourist can enjoy the product of that prosperous time. Economic Stagnation: More recent years have not been good to the Buenos Aires area and Argentina. The nation has seen decades of ups and downs – but mostly downs. The nation has been buffeted between constitutional governments and military dictatorships. Too often, even the constitutional governments have placed too little emphasis on creating wealth and too much on redistributing it. A failed currency policy in the 1990s destroyed the savings of millions. All of this has led to Argentina's migration from the top 10 economies to near the bottom of the top 100, now ranked at 82nd in the world in GDP per capita. No top ten nation from early in the 20th century has fallen so far. New Zealand managed to drop from 1st in the world in 1920 to 51st now, but still has a GDP per capita double that of Argentina. This economic decline is not so evident in the autonomous city of Buenos Aires, which is also called Capital Federal, analogous to the District of Columbia (DC) in the United States. This is the Buenos Aires of tourists, an area only slightly larger than Washington, DC, but with five times the population. The municipality of Buenos Aires is by far the most affluent urbanization in the nation. Even so, there are informal settlements within the city, such as Villa 31. Overall, approximately three percent of the city's population is in these kinds of informal settlements. Population and Distribution: According to the last census (2001), the city of Buenos Aires had fewer people than in 1947, having fallen from 3.0 million residents to 2.8 million. The city is also very dense, at 35,600 persons per square mile (13,700 per square kilometer), which is about one-half the density of Manhattan or the ville de Paris and double the density of the city of San Francisco. Most of the population lives in peripheral areas. This dominant suburban growth pattern is typical of world urbanization, as can be seen in such high-income nation capitals as London, Washington, Brussels, Copenhagen has been in the suburbs. Indeed, all growth in Paris has been in the suburbs since 1881. 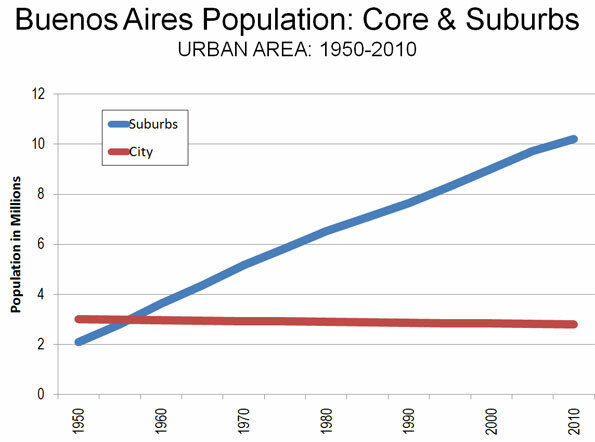 Like the ville de Paris, the city of Buenos Aires now accounts for less than 25 percent of its metropolitan area population (Figure 2). Overall, the urban area (area of continuous development) has nearly 13 million people and covers more than 1,000 square miles (2,600 square kilometers) for a population density of 12,100 per square mile (4,700 per square kilometer). This is 70 percent more dense than Los Angeles and one-third more than Paris but less than one-eighth that of Dhaka (Bangladesh). Suburban Buenos Aires: The suburbs of Buenos Aires differ from those in high-income national capitals. Generally, the suburbs are far poorer than the city and reflect the more recently less affluent Argentina that has emerged in recent decades just as the central area testified to the nation's former relative wealth. All of suburban Buenos Aires is in the adjacent Buenos Aires province, which has the largest population in the nation. Some of the suburbs are affluent, especially to the northwest, where suburban municipalities like Pilar and Tigre contain housing that could easily fit in upper middle income suburbs of the United States or Europe. However, even in these areas, there are close-by developments of low-quality and even informal housing, mostly housing domestic employees to the higher income population. The suburban poverty is far more pervasive to the southwest and the southeast. Many neighborhoods look similar to modest suburbs in Mexico City, though without the pervasive informal settlements. More people live in informal settlements in the suburbs than in the city, with estimates putting the number at above 500,000. More than the Core: Any thought, however, of Buenos Aires being a "compact city" is dispelled by the vast sea of lights visible on an evening flight out of Ezeiza International Airport. The urbanization stretches 30 to 40 miles in all possible directions, to the northwest, southwest and southeast (with the Rio de la Plata being to the northeast). However, probably no urban area illustrates the general rule that urban cores tend to be substantially different from their suburbs. Not only is suburban Buenos Aires far less dense, but it is far less affluent. Any who visits the city alone will have missed more than three-quarters of the reality. Note: GDP per Capita data based upon Angus Maddison's work for the Organization for Economic Cooperation and Development. Submitted by zion1122 on Thu, 08/22/2013 - 06:36. Submitted by john17nider on Sat, 08/17/2013 - 01:09. Submitted by john17nider on Mon, 08/05/2013 - 02:19. Submitted by john17nider on Mon, 07/08/2013 - 04:29. Submitted by john17nider on Sat, 06/22/2013 - 10:30. Submitted by josepmedia on Mon, 05/27/2013 - 01:41. Submitted by Ali Razavi on Sat, 11/13/2010 - 12:51. "Not only is suburban Buenos Aires far less dense, but it is far less affluent. Any who visits the city alone will have missed more than three-quarters of the reality." Can't that be said about just any place anybody goes on vacation for one-two weeks? Submitted by Anna Clark on Sat, 11/13/2010 - 10:35. This is a great article. I lived in Buenos Aires for a year b/w 1996-1997 while completing a post-graduate internship at the U.S. Embassy. I remember Puerto Madero as it was being built. I lived in Belgrano in the home of a family, once prosperous but at that time taking in students to cover costs. From my perspective, the city is extremely well-equipped in terms of public transportation. I was able to go anywhere on the subte or colectivos. I ventured into the suburbs regularly to teach ESL classes to executives. I never once during the entire year encountered any problems or crime (I realize this took a bit of luck). Now that I'm seeking a good living situation for my intern coming from Europe next spring, I find myself wishing I could offer her anything close to that setup. We have very few options in Dallas for anyone without a car or hours to spend waiting for the bus. The DART rail is coming along, but housing within walking distance of that is either expensive or low-income (very few middle-class single-family homes are within walking distance). In BsAs, it seems to me that residents from San Isidro to Saavedra to Belgrano to Palermo to Recoleta (and similar trajectories to the south) have relatively easy access to convenient public transportation. I recognize that my situation as an American exchange student does not reflect that of most citizens and that many can't afford to live in the city. That said, it's nice to have experience living in a city where you can travel from the far-flung suburbs of Greater Buenos Aires into the core and get by just fine without a car. At least it gives people access. You simply can't do that in my city, not yet at least. Submitted by egipt on Thu, 11/11/2010 - 14:33. If you were to mention in North America that you were going to Argentina, most people would ask “Is it safe?” Or they will talk about how they heard people are kidnapped, that there is a lot of crime and that it’s a dangerous place to visit. Is Buenos Aires dangerous? This is a difficult question without a concrete answer. In general, yes, there is a certain degree of danger here. Being the capital of Argentina, and a city of 13 million people, it is the most dangerous city in Argentina. I must admit that personally, I have never felt threatened in Buenos Aires. I walk around by myself at whatever time of the day or night, and have never had anything happen or almost happen to me. I have never even seen any crime as it was happening. In general, Buenos Aires is quite safe, much more so than some of the other major cities in South America, such as Rio de Janeiro, Lima, Quito, or Bogota. However, there is certainly a lot crime in this city, and one must be careful, smart, and lucky to live or vacation here without ever having any problems.